Moments before the Florida Scholastic Press Association announced the Todd C. Smith Florida Student Journalist of the Year via Twitter, senior Emily Fussell busied herself running around the circle of her gathered peers and doing push ups to channel her adrenaline. Twitter feeds constantly refreshed as the clock ticked toward noon, so much so that Twitter temporarily blocked those peers from refreshing. Still, screams of excitement filled the silent library as Fussell’s portrait accompanied the first place tweet. “When I found out I won I was so excited. Ms. Norris and a few of the editors and I were waiting around to see the results. It truly means so much to me that I was chosen for this prestigious award,” Fussell said. The award, named in honor of Todd Carper Smith, a Tampa journalist killed by Shining Path guerillas while working in Peru, recognizes the top three senior scholastic journalists in the state. Fussell is recognized alongside second place winner Bryson Tiller, Hagerty High School, and third place winner Rebecca Schneid, Marjory Stoneman Douglas. Fussell is the fourth consecutive Boone Publications student to win this award; preceded by 2018 Hilights Editor-in-Chief Jack Rummler, 2017 Legend digital media editor Tyler Rispoli and 2016 Legend Editor-in-Chief Mathew Cassler. “I was definitely nervous that there would be some bias from the judges because Boone has won three times in a row. I hoped that as journalistic organization, they wouldn’t let that get in the way of picking the best candidate, no matter which school they go to,” journalism teacher and adviser Bridgette Norris said. Applicants must submit a portfolio, self analytical essay, resume, transcript, action photo and letters of recommendation. Fussell opted to create a website to showcase her work from her three years on the Legend staff. “The most tedious part of the application was compiling all of the work to put on my website. Writing about the work was more difficult but finding took a lot of looking and remembering,” Fussell said. Winners at the state level land a $1000, $600 and $400 check, respectively. Fussell now qualifies for the national level and will submit her portfolio for judging again. The national winner receives a $3,000 scholarship and runners-up receive $850. “I am very proud of all of the pieces that I put on my site. I am the most proud of my self-analytical essay. Writing about my strengths and weaknesses in a more narrative setting was very challenging and I think it made me grow as a journalist the most,” Fussell said. 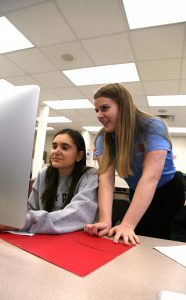 Although the work submitted can only come from time on staff, Fussell’s involvement in scholastic journalism started in the 8th grade when she worked on her school’s yearbook. This award comes after three years on the Legend yearbook staff, two of which she held an editor position. Fussell’s time on Legened staff awarded her several recognitions including; Gold Circle Award for Yearbooks: Student Life Spread “Storm Splits Week,” Colombia Scholastic Press Association(2018), Silver Crown Finalist, Colombia Scholastic Press Association (2018), Best of the Student Life Spread: “One for the Books” Quill & Scroll (2017), Blue and Gold Award: All Over the Place, Legend yearbook, Quill & Scroll (2017) and staff award for best attitude (2017 and 2018). “I have spent so much of my high school years working on yearbook and I don’t regret a single second of it. The classroom is like a home to me and the staff is my family,” Fussell said. To see Fussell’s portfolio, click here.